Halsey has, for the most part, abandoned the specificity that was key to her lyrical successes on Badlands. I quite enjoyed Halsey’s first album, Badlands, when it dropped in summer 2015. It was an incredibly strong debut from a young artist whose lyrics combined intimate, breezy poetry with bruised vulnerability. Delivered in her husky, compelling voice, songs from Badlands like “Colors", “Strange Love", “Coming Down", and “Roman Holiday” are just great songs, period. Halsey’s lyrics often deal with drug use and sexuality in fairly frank, unapologetic fashion, creating the persona of a messy, raw young adult finding her way in the world. If Taylor Swift is the so-called good girl of pop who knew you were trouble when you walked then, then Halsey, in contrast, would remind you that you knew she was trouble when she walked in -- but you love every minute of it. It is with disappointment, then, that I have to report that Hopeless Fountain Kingdom, Halsey’s second full-length, represents a step backward regarding quality. Halsey has, for the most part, abandoned the specificity that was key to her lyrical successes on Badlands. Where her Badlands lyrics had a consistent confessional quality, that same quality is intermittent at best on Hopeless Fountain Kingdom. We’ve gone from the specific, honest (and thus more memorable) lines like “Do you remember the taste of my lips that night / I stole a bit of my mother's perfume? Cause I remember when my father put his fist through the wall / that separated the dining room” (“Roman Holiday”) to the utterly generic “I don’t wanna fight right now / Know you always right, now / Know I need you ’round with me / But nobody waitin’ ’round with me” (“Now Or Never”). The fact that Hopeless Fountain Kingdom is meant to be a dystopian concept album about a Romeo-and-Juliet type of romance would lead to one thinking that more, rather than less, specificity and detail would serve the story. Alas, it is not so and knowing anything about Halsey’s concept for this album does nothing to enrich the overall listening experience, meaning that it could well have been scrapped. On the whole, the narrative quality of Halsey’s Badlands lyrics, while at times awkwardly phrased, were what made those songs so memorable. Her lyrics on her 2014 EP Room 93 were in the same vein, with the overall music/lyrics combination of “Is There Somewhere” nearly literally knocking my socks off. While the verses do scan a bit better on Hopeless Fountain Kingdom than on her prior releases, it’s just not worth the trade-off. For example, at least three songs on Hopeless Fountain Kingdom reference missed phone calls in the context of a romantic relationship, which is probably something that every cliched breakup song ever written mentions as well. To be able to take in the scattered charms Hopeless Fountain Kingdom has to offer, you have to make yourself get past the truly laughable opener, “The Prologue", where Halsey recites the prologue of Romeo and Juliet, followed by a highly distorted bit that Imogen Heap did better in “Hide and Seek". As with Badlands, the first half of the album is stronger than the back end, and the next four tracks of Hopeless Fountain Kingdom deliver in relatively fine form. “100 Letters” is probably the strongest track on the album, and sits comfortably within Halsey’s stylistic range. “Eyes Closed", “Heaven in Hiding", and particularly “Alone", aren’t up to the level of the songs of Badlands or Room 93, but certainly aren’t bad. (I have to wonder if the lyrical and musical resemblance of “Alone” to Alessia Cara’s 2015 hit “Here” is intentional.) Then comes the album’s first single, the aforementioned “Now Or Never", which is the first track I actively found myself skipping during repeat listenings -- it’s bland, repetitive filler and a poor choice for a single. “Walls Could Talk", which provides a sigh of relief between “Lie” and “Don’t Play", is a lesson in “less is more” -- it’s catchy, simple, and an entirely satisfying song that lasts under two minutes and doesn’t feel the need to overstay its welcome. “Bad at Love” sees Halsey detailing four failed relationships in rapid-fire rhymes; although Halsey has referenced being bisexual in interviews, it’s only in “Bad at Love” and “Strangers” that she references loving women. “Bad at Love", while feeling a little bit like a throwback to mid-2000s pop, is notable for painting Halsey’s relationships with men and women with the same brush, which is certainly not common even in 2017. “Strangers", a duet with Lauren Jauregui of Fifth Harmony, details a failed relationship with another woman, and provides a rather great combination of both Halsey’s and Jauregui’s voices even if the lyrics veer a little too much into the generic: “I miss the mornings with you laying in my bed / I miss the memories replaying in my head.” I want to push back and ask Halsey: what memories? What kinds of memories? What did they make you feel? 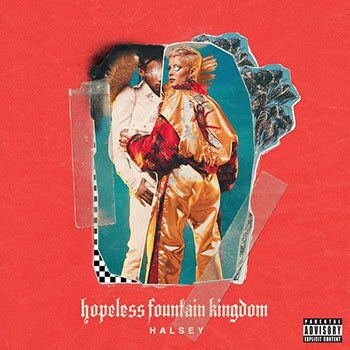 Hopeless Fountain Kingdom closes with a trio of songs that failed to make much of an impression: “Angel on Fire", “Devil in Me", and “Hopeless", although “Angel on Fire” contains the most teenager-y line of the album, when Halsey opines that “nobody seems to ask about me anymore / And nobody seems to care ’bout anything I think.” Upon checking the track listing of the album, I learned that the 16-track version I had listened to was the deluxe version, while the standard edition omits “Walls Could Talk", “Angel on Fire", and, curiously, “Heaven in Hiding". I have to ask: when you’re writing a concept album, where the precise order of songs is so vital to the unfolding of narrative, doesn’t having two versions of the album defeat the purpose? I understand that having special and deluxe editions are to encourage people to spend more money (and often, to buy the album several times over to get specific tracks available from one retailer), but they strike me, in general, as pretty cynical cash-grab opportunities. Perhaps, having tasted mainstream fame when she performed guest vocals for the Chainsmokers’ juggernaut hit “Closer", Halsey went back to the drawing board hoping to recreate that same top-40 impact, a desire which is all too visible in club-ready numbers like “Eyes Closed", “Now or Never", “Lie", and “Don’t Play". Where Badlands established Halsey as one of the more talented and dynamic artists of her generation, Hopeless Fountain Kingdom is both overambitious in theory and mundane in practice.